Despite his "choker" reputation, the Cowboys captain is actually the best fourth-quarter QB in the NFL. He just needs to start performing in the first three quarters, too. This Sunday night, in front of a huge national audience, the Cowboys and the New York Giants will renew the NFL’s most heated rivalry. And at the center of it will be the parallel rivalry between the teams’ respective quarterbacks, Tony Romo and Eli Manning. But is that really a fair assessment of Romo’s NFL legacy? It depends on how you define “choke”—because a look at Romo's career stats proves he's actually one of the best overall finishers in football. It's important to note that Romo has had only one truly bad playoff game: On January 17, 2010, the Minnesota Vikings crushed the Cowboys, 34-3. It is now largely forgotten that the previous week he had led his team to a 34-14 win over the Eagles in an outstanding performance—244 yards, two TDs, and zero interceptions for a game rating of 104.9. Of four playoff games, Romo’s two other losses were to Seattle early in 2007 and the New York Giants in January 2008. He wasn’t great in either game, but the games were both heartbreakers. The Cowboys lost both by a total of only five points. The loss to the Giants was a particularly bitter end to the 2007 season for Cowboys fans after the team’s regular-season success of 13-3, their best win-loss mark under Romo. But Eli Manning began to peak that very afternoon and from that point on he rode a wave that carried the Giants to an even bigger upset—some say the biggest Super Bowl upset ever—over the unbeaten New England Patriots for the championship. So perhaps Romo and the Cowboys simply collided with the team of destiny that year. Since then, the Cowboys have failed to make it to the Big Game, going 8-5 under Romo (who missed three games with an injury) in 2008, 11-5 in 2009, 1-5 with Romo in 2010 (another injury kept him on the bench for 10 games), and 8-8 in both 2011 and 2012. How much of that failure can be pinned on Romo? Quarterback is, of course, the key position in the game, but a close evaluation reveals the Cowboys had problems that have nothing to do with the man who takes the snap. Last year, the Cowboys 8-8 record and failure to make the playoffs was largely attributed to Romo’s league-high 19 interceptions. But in Week 17 they were still in contention for a playoff spot mainly because of Romo, who led Dallas on five fourth-quarter come-from-behind wins, a feat not achieved even by Cowboys Hall of Fame QBs Roger Staubach and Troy Aikman. Some of those interceptions were caused by the simple fact that the Dallas defense was so bad that he had no choice but to keep throwing the ball—his 648 pass attempts amounted to the third highest in the league. Because the Dallas D couldn’t hold their opponents, the Cowboys were constantly surrendering the lead, putting the pressure on Romo. And this is an ongoing problem: The Cowboys were 24th among 32 teams last year in points allowed. In only one of Romo’s seasons—2010, when they were second in the league in points allowed—has Dallas finished better than 13th in scoring defense. Their two toughest losses of the 2012 season can’t be blamed on him, either. On October 14 they played the Ravens in Baltimore. With 48 seconds to play, Romo moved his team from their own 20 to the Baltimore 33 where, with two seconds on the clock, kicker Dan Bailey missed a 51-yard field goal try. Dallas lost 31-29—hardly a disgrace, in retrospect, considering the Ravens went on to become the Super Bowl champs. Two weeks later, at home, the Cowboys lost 29-24 to the hated Giants, coming back from a 23-point deficit to take a fourth quarter lead. With seconds left, Romo threw a desperation pass to Dez Bryant, who came down with the ball inches—literally a fingertip—out of the back of the end zone. So yes, it’s true that Tony Romo’s lack of postseason successes keeps his name conspicuously absent from the roster of this generation’s greatest Super Bowl-winning quarterbacks—like Tom Brady, Ben Roethlisberger, Peyton Manning, Eli Manning, Aaron Rodgers, and Drew Brees. But here’s a question: How many of the aforementioned quarterbacks have a career fourth-quarter passer rating over 101? Every year he has started for Dallas, Romo’s passer rating has been over 90.0. Only two other quarterbacks, Steve Young and Peyton Manning, have accomplished that. Young is in the Hall of Fame, and Manning certainly will be some day. Romo also has an undeniable ability to step up in the fourth quarter. His fourth-quarter rating of 101.9 is better than the Packers’ Aaron Rodgers (101.2) and New England’s Tom Brady (92.4). Of Romo’s 177 career touchdowns , nearly one-third, 56, have been thrown in the fourth quarter. If performing well in the fourth quarter qualifies a QB as a clutch passer, then Romo should be regarded as one of the—if not the best—pressure passer in the game. Unfortunately for Romo, many believe that the litmus test for whether you’ve succeeded or failed in football is the same as in baseball: Did you win the last game of the season? 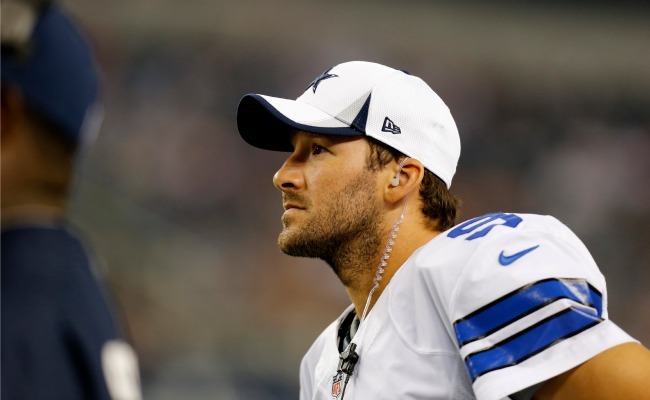 But while fourth-quarter comebacks are thrilling, Romo needs to get his team in gear earlier. He turned 33 in April, and he may not have many more opportunities to show the world, or at least the sports media, that he does, indeed, belong in this generation’s class of elite quarterbacks—a class that includes his Giants counterpart, Eli Manning. Dallas fans can likely settle for a bit less heart-stopping action this year, as long as the end result is a winning season; games with better defense, lower scores, and more time running the ball on the ground in the fourth quarter to protect a lead rather than forcing their quarterback to frantically play catch-up could help. And then, maybe Tony Romo will finally join the elite. After all, if you can be football’s best fourth-quarter quarterback, surely you can learn to be the sport’s best first-quarter quarterback, too.